Will we really get to say 'no more cables'? There’s growing evidence that Apple is working with Energous – a company which is developing a wireless charger that can work over up to 15ft, meaning the device it’s charging doesn’t need to be in contact with it. In a research note from market analyst Louis Basenese, obtained by Apple Insider, it’s noted that someone who worked as Regulatory Certification Program Manager at Apple for seven years has recently taken a similar job at Energous. While another senior Energous employee is a member of the same wireless charging ANSI Working Group as Apple. Energous is also apparently aiming to release a mid-range transmitter sometime in the third or early fourth quarter of 2017, which would be in time for the expected iPhone 8 launch. And Basenese speculates that the rumored move to a glass back on the next iPhone is further evidence that wireless charging is on the way (since it’s trickier to implement through metal). On their own, these things could be written off as coincidences, but when you consider existing evidence – such as the fact that Energous itself has previously said it’s working with “one of the top five consumer electronics companies”, and has partnered with Dialog Semiconductor – a company which primarily supplies chips to Apple, it starts to look a lot more convincing. If the iPhone 8 does have long-distance wireless charging that could give it a massive selling point over the competition, and make wireless charging genuinely a lot more useful than wired. 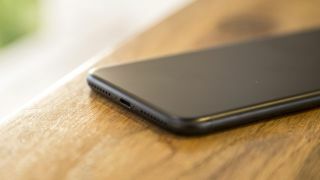 That’s a big if, but even if it just uses more conventional short-range wireless charging it looks like the iPhone 8 could go wire-free, as it’s also recently been rumored that Foxconn is experimenting with the tech for Apple. There are unlikely to be any firm answers for a while, but the days of plugging your iPhone in could be numbered.